Boilers provide heat for many homes in Minneapolis, Minnesota, as radiant heat is more common in older homes and provides more energy efficient heat than forced air systems, as long as long as they are tuned, cleaned and/or serviced yearly. It is important to have a licensed hot water contractor with experienced boiler technicians, like Mill City Heating & Cooling, to install, repair and provide maintenance on boilers. Many heating contractors do not have proper boiler technicians with competency credentials to operate on boilers in Minneapolis. This is not the case with Mill City Heating & Cooling, as all of our technicians have the proper boiler competency credentials. One of our recent customers chose Mill City Heating & Cooling to install a new boiler for his duplex because of these credentials. Before discovering Mill City, our customer initially hired a plumbing contractor to install a boiler in the Longfellow Neighborhood of Minneapolis. 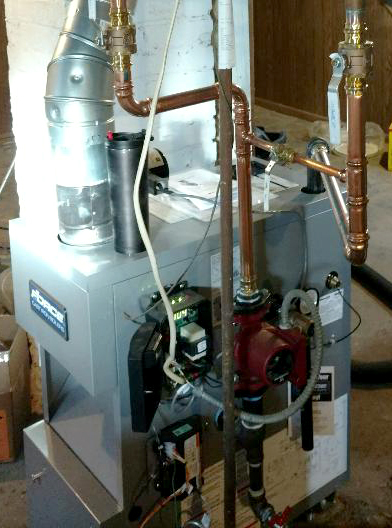 After he paid the down payment, the contractor dropped off an over-sized boiler that cannot be legally installed in the City of Minneapolis. Not only that, the contractor never showed up again to try to install it. It was at this point that the customer searched elsewhere and discovered Mill City Heating & Cooling. After contacting us, we performed a heat loss calculation and replaced the existing boiler with a new Force boiler, which is made in the USA by U.S. Boiler Company. Our customer is now happy that he can keep his rental tenant satisfied with consistent heat.